Llamas were first domesticated by the Incas, in the Andes Mountains around 4000 BC. Llamas were well suited to survive in the harsh conditions of the mountainous areas, and could still produce wool, meat, and fertilizer. During this period, the breeding and production of llamas was monitored closely by state llama herders, called Llama-Michis. 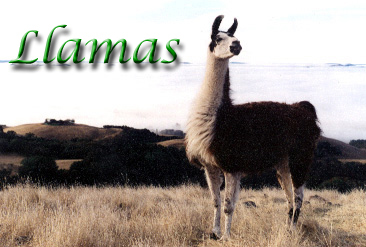 Llamas were the property of the Incan government; the hunting of llamas was forbidden. Males were often sacrificed, however, as were barren females. Male llamas also played a key role in various religious ceremonies. Llama fiber was woven into Aluascay, for commoners, but only the best fiber was woven for the nobility. Their meat was eaten fresh, and any extra would be dried and saved for a later time. Parts of a llamas digestive tract were considered useful for medicinal purposes, and their natural ability as beasts of burden was invaluable to the Incan economy during these times. Classic llama behaviors include such things as spitting, rolling, and guarding. There are many common misconceptions about llamas spitting; it is done to settle arguments, establish dominance, and express things like fear or discomfort. Llamas will rarely ever spit at a human, and warnings are given first. The ears will go back, the head will be tilted back, and occasionally a warning spit will be given into the air. Rolling helps a llama fluff its fiber, and to maintain the fibers insulative properties. Llamas prefer bare areas of dust dust pilesand usually have no qualms about creating their own. Llamas also have a natural guarding instinct, and can guard anything from sheep to ducks, deer, or cattle; they adjust quickly to being around even the most different species. Qualities in a llama that make for good guarders include independence, leadership, athletic ability, awareness, and curiosity. Our llamas are raised in our small herd with daily individual attention - llamas you will enjoy interacting with, not just viewing from a distance. Magical Menagerie's llamas are more thoroughly trained - we raise our llamas to be haltered, to enjoy walking with you, and to be accepting of new places and experiences. 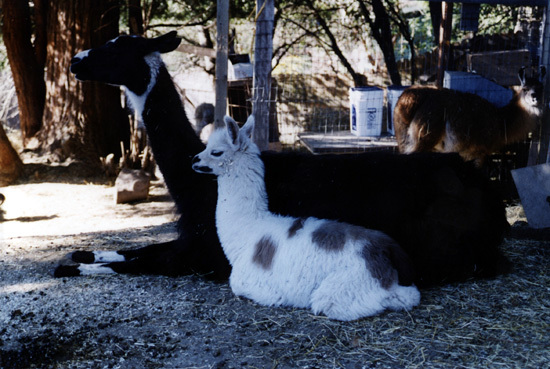 Our llamas are bred for excellence - breeding decisions are given meticulous attention. We emphasize structurally correct, healthy, well-mannered llamas. Our llamas are Champion, heavy wool animals. Our llamas distinguish themselves in the show ring, on the trail, visiting the public, and with their new owners.